Local social justice educators are organizing a day of action in honor of Dr. King’s legacy on Monday, January 15th. 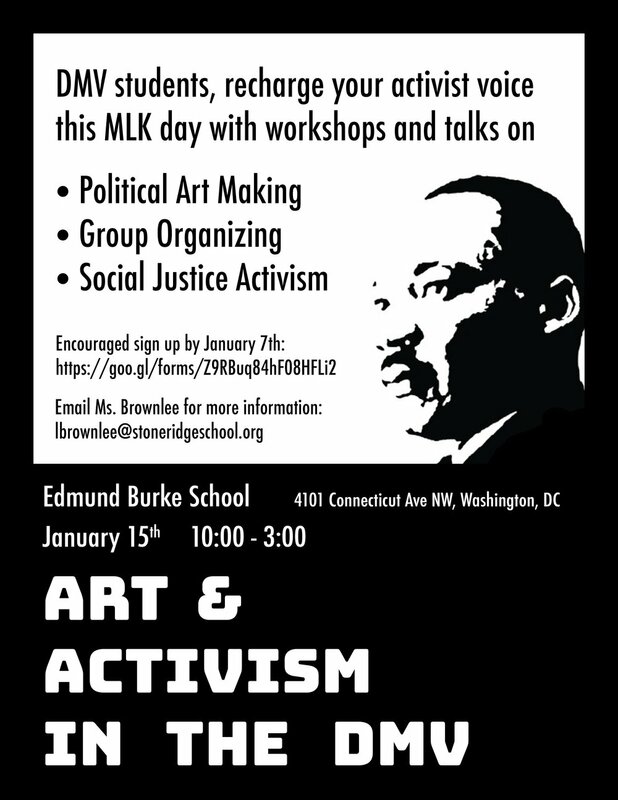 The event, Arts and Activism in the DMV, will take place at Edmund Burke School (4101 Connecticut Ave NW, Washington, DC 20008) from 10 am – 3 pm on Monday, January 15. The morning will begin with workshops on art and advocacy led by local experts. The afternoon will offer opportunities for “artivism” (creating art for social good). The day will end with a community share-out of our artivism projects followed by reflections. It should be a powerful day! If anyone has questions, email Lauren Brownlee, Director of Social Action at Stone Ridge School of the Sacred Heart, at lbrownlee@stoneridgeschool.org. Participants are encouraged to register by Sunday, January 7.